What do you do when you hear a waterfall? Most people’s first instinct is to look for the source of the sound, then figure out the best way to get closer to it. This is certainly true for one of Yosemite Mariposa County’s top attractions: Yosemite Falls, a towering, 2-425-foot set of falls that flow from November to July, seeing peak flows in late spring to early summer. It’s so magnificent that people literally stop their cars in the middle of the road, get out and start to wander toward the waterfalls on a daily basis in Yosemite National Park. The lower part of North America’s tallest waterfall, Lower Yosemite Fall is the final 320-foot (98-meter) cascade and easily the most accessible part of the falls. Thunderous in spring and early summer when the waterfall peaks in volume, you can expect to get sprayed with water from Lower Yosemite Fall when standing on the footbridge near its base. The Lower Yosemite Fall hike is a must visit for its accessibility and proximity to this massive waterfall. A Lower Yosemite Falls trail hike is a short, easy walk that rewards with spectacular views of both Upper and Lower Yosemite Falls, especially in the summer. From the Valley Visitor center, follow the bicycle path to shuttle stop #6 and begin the trail for Lower Yosemite Falls. 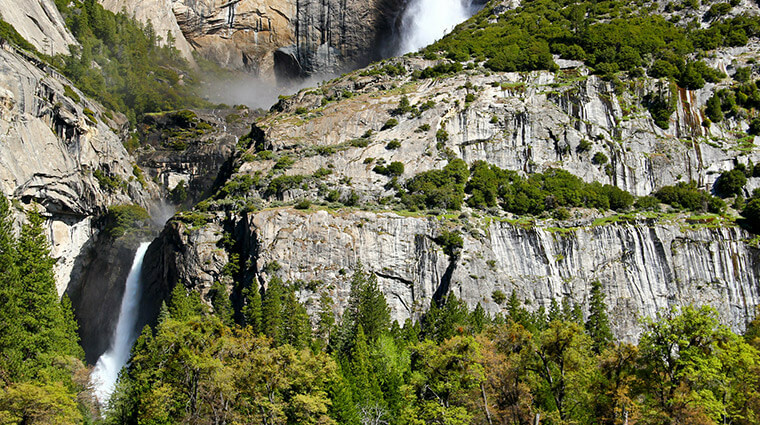 Consider walking the loop in a clockwise direction for best views of Yosemite Falls. This eastern portion of this loop trail is wheelchair accessible (when not covered in ice or snow) and it is also pet and stroller friendly. Or park at the Yosemite Valley Lodge and access the trailhead near the parking lots at the lodge. Are you ready to “fall” in love with waterfalls? Check out this visually stunning look at Yosemite’s top waterfalls through the eyes of visitors and park rangers in episode #2 of Yosemite Nature Notes entitled “Yosemite Falls.” It’s really a breathtaking video that’ll make you want to pack for your next Yosemite trip ASAP. The trail to Lower Yosemite Fall is accessible year-round. When the water is at its peak in spring and early summer, you can expect to get a little wet. This waterfall is often dry from late July or August through October, but in certain years such as the epic winter of 2016-17, it can last much longer, providing visitors with jaw-dropping that last well into summer. Then, when you’re ready to start planning your trip, head over to our Lodging page to find the perfect place to rest your head at night and also visit our Dining and Things to Do pages to plan your next getaway to Yosemite Mariposa County.